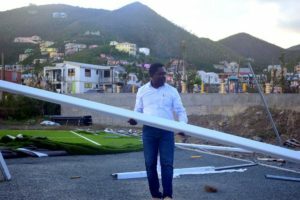 ROAD TOWN, Tortola, VI – Following a visit from FIFA’s African and Caribbean Regional Director, Mr Veron Mosengo-Omba, on Friday October 13, 2017, the BVI Football Association (BVIFA) has been encouraged that support for the rebuilding of football within the Territory will be speedily provided by the World Governing Body. Veron was on a whistle stop tour that had already included the Turks and Caicos Islands, St Thomas and St John, to assess damage and prepare reports for the FIFA President, Gianni Infantino, but noted that what he saw in the Virgin Islands (UK) was by far the worst damage. “FIFA has a mandate to get every Boy and Girl to kick a ball and here you just cannot! I have been sent by the FIFA President to see all the Islands hit by the recent hurricanes and this is my third stop. What I have seen here is horrible, just like after a war and FIFA needs to urgently assist the Association to restore the headquarters and the fields,” stated Veron. Although the damage done to the Territory is far reaching and goes way beyond the need for sport to be at the forefront, Veron noted that without an office football cannot be organised properly and the game has to be played outside and right now the VI just can’t do that as there is no place to kick the ball. 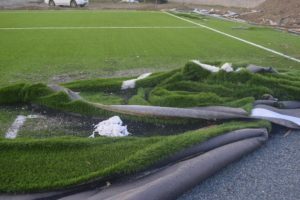 “The other islands have all been impacted, but have fields left to play on, here there is no fields to play and FIFA will have to make this a priority and they will act quickly to restore Football here,” concluded Veron. Veron also felt that the response from FIFA would be quick and help was coming to rebuild facilities.